We all have our favorite holiday dinner traditions, but what about BREAKFAST? When I was growing up, Christmas morning meant one thing: cinnamon rolls! They were a tradition as much as opening gifts was— and so was the tradition that they ended up just a little overdone because everybody got distracted by the presents. Christmas mornings aren’t exactly conducive to baking, are they? Don’t you wish holiday breakfasts could just cook itself while you focus on your family? Us too, and when we saw this recipe over on Recipes That Crock, it seemed like that wish just might be coming true! And even if it wasn’t wish-fulfillment, something called “Crockpot Cinnamon Roll Casserole” was something we HAD to try— so I did! I mean, come on— crockpot? Cinnamon roll? Easy recipe? How could I resist? Here’s how it went! Spray your crockpot with nonstick cooking spray. Open the cans of cinnamon rolls and set aside both icing packets. Cut each cinnamon roll into four pieces. 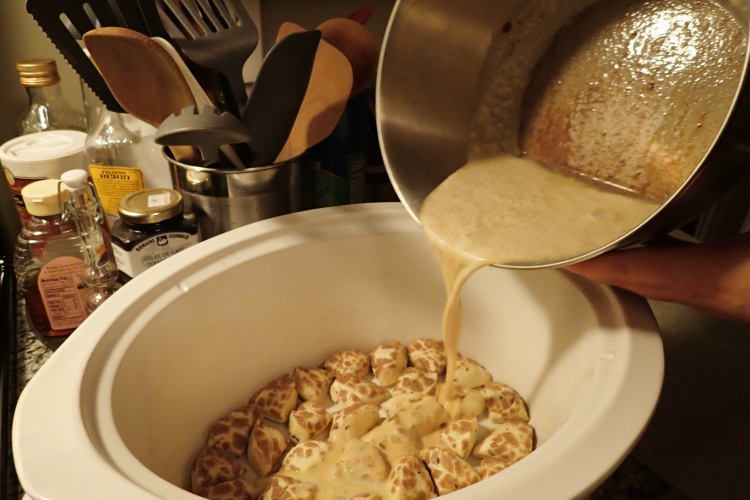 Spread approximately half of the cinnamon roll pieces in a layer in your crockpot. Make sure you cover the bottom of the crockpot as completely as possible, and don’t be afraid to use a little more than half of the pieces if you need. (I limited myself to exactly half and ended up wishing I hadn’t!) Total coverage is important for the next step, when you . . . Mix the eggs, cream, maple syrup, vanilla, cinnamon and nutmeg together until well-blended. Pour evenly over the rolls in the slow cooker. If you’ve covered the bottom as completely as possible, it will bake into the rolls, rather than cook underneath it. Create a second layer of cinnamon rolls with your remaining (approximate) half of pieces. Don’t worry if they bobble or sink into the liquid a little! We’re making a casserole, not a layer cake. Open one of the icing packets and spoon it over the top layer of rolls. Distribute it as evenly as you can. Cover and cook on low for 2 1/2 to 3 hours, until the rolls have set and the sides are golden brown. I let mine cook for about 2 hours and 45 minutes because I thought the middle still looked a little goopy, but that ended up being a little too long for the sides, which got quite crispy. Lesson learned: it’s OK if your middle appears a little soft; when the sides reach that golden-brown, your casserole should be done! Open the remaining icing packet and drizzle over the top of your finished casserole. Serve and enjoy! This one was really sweet, easy and interesting, friends! Of course, you can’t really go wrong with cinnamon rolls, and cooking them in the slow cooker ended up allowing them to reach a perfect consistency, especially for the ones more toward the middle. (Seriously, as soon as those edges are brown, you’re done!) The egg mixture makes such an intriguing addition, too. Recipes That Crock compares the bottom layer to a flan, but I didn’t find that to be so. The closest comparison is probably a sponge or pound cake, but that bottom layer is still recognizably made of cinnamon rolls— just very moist, flavorful cinnamon rolls! The dish is also very much a casserole, so those layers all mix together pretty much as soon as they hit your plate! You end up with a really nice mix of different levels of roll, cinnamon, sweetness and almost-cake-maybe-flan that keeps you happily guessing as you eat. Plus, a tiny bit of that egg mixture ends up cooking between the layers of rolls, so every so often you get a taste of perfectly-slow-cooked egg that makes you feel a little bit better about eating something so sweet for breakfast. They have protein, after all! So would we recommend and try this one again? Absolutely! It’s SO EASY, and the cinnamon sweetness really is great. You could probably make it for dessert, too! Don’t keep your division of cinnamon rolls strictly even. Make sure you get the bottom of that crockpot as fully covered as possible. Keep a close watch as you near that 2 1/2 hour mark. Everybody’s slow cooker is different, so your time will vary, but remember that when those sides and edges reach their golden-brown color, the casserole is done! Experiment with the eggs in this recipe! While I thought the addition added an interesting flavor to the mix, my husband thought it was a little on the eggy side. I think this recipe would work just fine if you took it down to just three eggs or experimented with different combinations of whites and yolks – just four egg whites? Three eggs and one egg white? – to get your preferred level. Now it’s your turn! Have you ever seen anything like this breakfast casserole before? Be sure to tell us if you give this one a try and what YOUR experience with it is!